The expanded illusion of space in fifteenth-century painting enriched a pictorial convention known as continuous narrative: the integration within a single picture of two or more chronologically distinct episodes, which repeat characters as necessary. With precedents in ancient Roman sculpture, continuous narrative was often employed in medieval art as well. 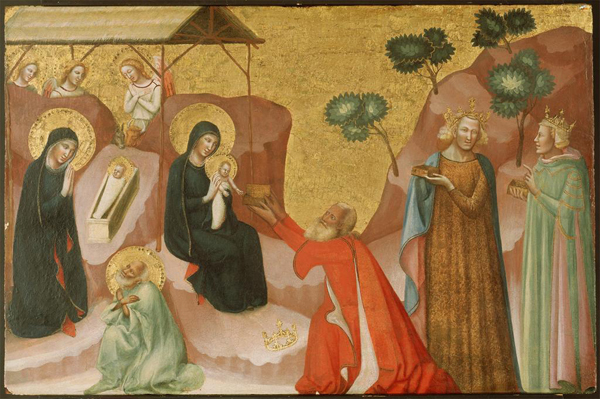 In a painting of c. 1325–30 by Jacopino di Francesco, The Nativity and the Adoration of the Magi, the Virgin and Child appear twice, side by side. At far left they take part in the Nativity scene with Saint Joseph and three angels; immediately to the right of that scene, they appear with the three Magi in the later episode of the Adoration. of time when our eyes see the same object in two different positions: “Vision comprehends movement by perceiving the moving object in two different positions, in two different moments between which is a perceptible amount of time.”9 So it is in Jacopino’s painting that although neither of the two representations of Mary and Jesus conveys a sense of movement when examined individually, their appearance in two different places (and in two different poses) indicates that they have moved through time. Even with this explanation, the modern viewer may be tempted to dismiss the technique as primitive—evidence of the lack of naturalism in fourteenth-century art, comparable to the gold background by which Jacopino has represented heavenly light, or the schematic trees and rocks intended as landscape. Surprisingly, however, continuous narrative remained in use well into the fifteenth century—even as artists were rejecting other medieval conventions in pursuit of greater naturalism in the treatment of pictorial space, landscape, and the human figure. By radically expanding the illusion of depth, fifteenth-century systems of perspective opened up extensive terrain in which to depict multiple narrative events. Combined with techniques of linear and aerial perspective, continuous narrative created possibilities for more extended, elaborate, and episodic forms of storytelling.